Questionable accounting practices have allowed cannabis companies to inflate their profits. Cannabis companies do in fact make fairly reasonable assumptions in valuing these assets given the guidelines they are working within. P/E multiples are effectively meaningless for these companies. IAS 41 Agriculture sets out the accounting for agricultural activity as follows: the transformation of biological assets (living plants and animals) into agricultural produce (harvested product of the entity's biological assets). The standard generally requires biological assets to be measured at fair value less costs to sell. The incremental costs directly attributable to the disposal of an asset, excluding finance costs and income taxes. The issue with cannabis companies using these standards is that the plants are still in the ground. They could perish in a drought, drown in a rain storm, be eaten by bugs, and these are only three of many perilous situations. If any of these events were to occur a company that looks profitable on paper could immediately lose all its value. These risks are present in every agricultural sector, but with cannabis, because it’s such a new industry, there are often inconsistencies in the way that cannabis producers arrive at the fair market value of their crops. Also, even though cannabis has been legalized at the Federal level in Canada the roadblocks associated with the distribution side could still take months even years to overcome which may be an impediment to monetize the biological assets. The purpose of this article is to discuss more in depth the accounting policies of some of the major Canadian cannabis companies and how it has benefited them. An average of around 150 to 300 grams (600 for experienced growers) with a 600-watt HPS lamp in a grow room that measures 1.2 x 1.2 x 2.5 m.
An average of around 250 to 500 grams (1000 for experienced growers) with a 1000-watt HPS lamp in a grow room that measures 1.5 x 1.5 x 2.5 m.
Getting the right light makes a huge difference, you’ll also need the right nutrients, the right equipment, good air quality, a good room for the plants to grow in, and spacing. Light is critical, but becoming an experienced grower gets you more grass. Nine-month financials show that the biological asset valuation technique has contributed $90.5M ($120.67M annualized) net of write-offs to net income as of December 31,2018. 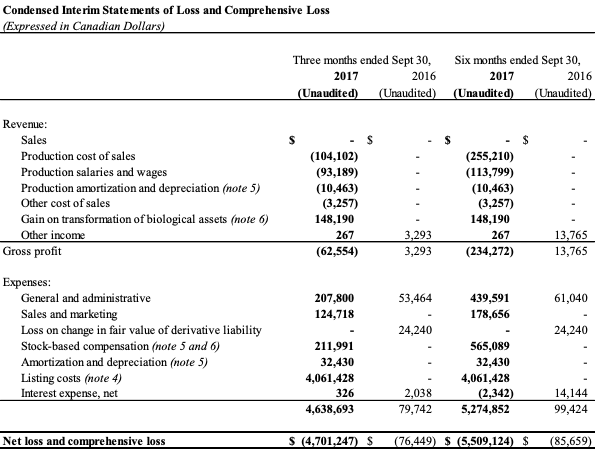 Allowing for a 15% gross margin and reduced a $437.2M ($582.9M annualized) loss to a $346.7M ($462.3M annualized) loss. This valuation decreased their net loss ~21%. 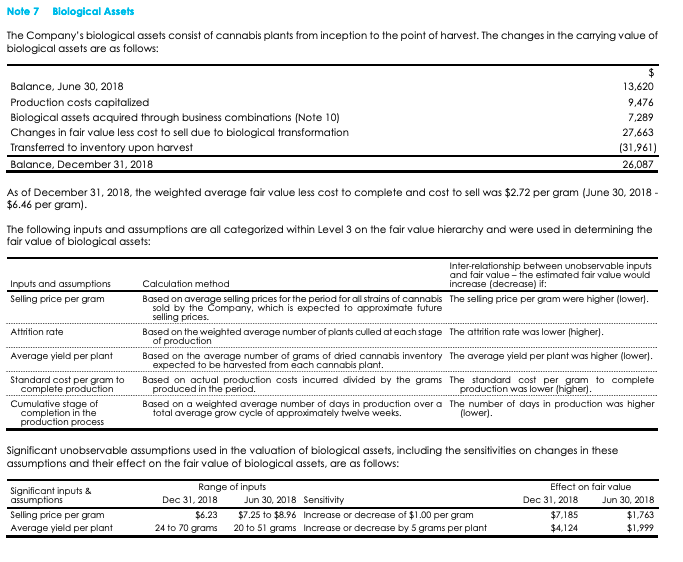 As per note 7 on biological asset valuation, it is acknowledged that due to the lack of readily available market data they are valuing biological assets at level 3 of the valuation hierarchy based on unobservable market data and discussed further in their Q3 MD&A as follows "Fair market value estimates are based directly on the Company’s selling list prices for specific cannabis strains and estimated or expected selling prices to provincial crown corporations in a regulated domestic recreational market, as applicable, though no such prices have yet been established." Their valuation methodology is incomplete and ambiguous at best. 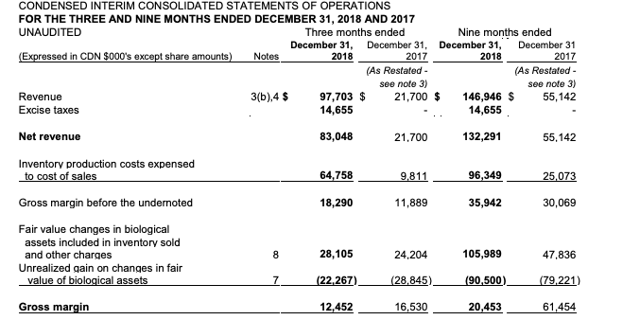 Aurora was able to add $27.7M ($55.4M annualized) to its net income for 6-months ended December 31, 2018 on a $224M loss. As we can see this adjustment helped their earnings ~17% on a $135.5MM ($271MM annualized) loss. 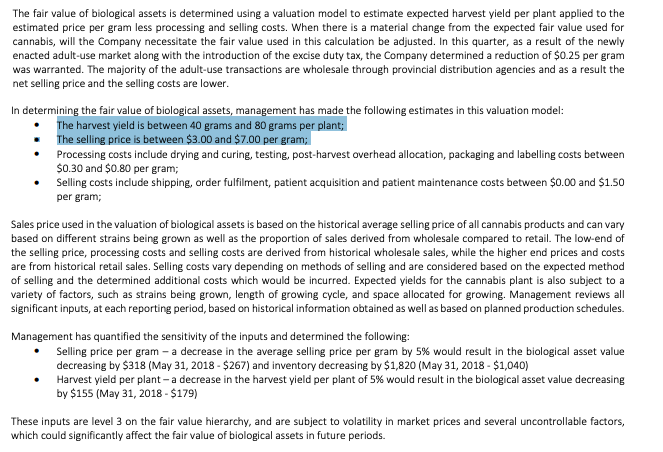 As per note 7 on biological assets Aurora uses assumptions on average selling price/gram in line with its counterparts like Canopy, but average yield per plant is far more conservative and is therefore not helping their gross margins as much as Canopy. 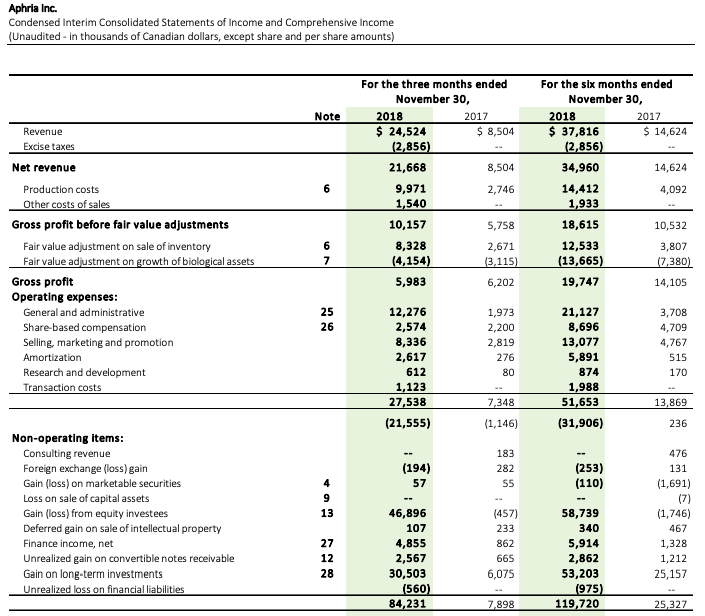 Aphria was able to subtract $13.7MM ($27.4MM annualized) from its bottom line, as it produced a $80MM profit ($160MM annualized), meaning the profit was inflated ~20%. 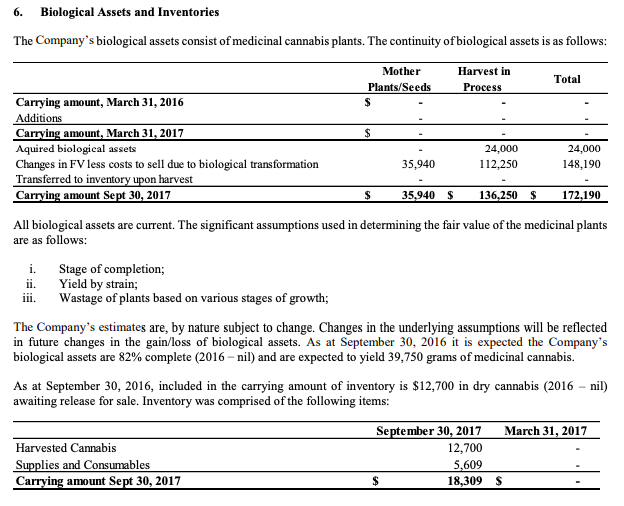 As we can see Aphria uses fairly conservative assumptions and gives a fairly comprehensive discussion on their assumptions. First, they state a harvesting period of 12-16 weeks, about in line with Grasscity's estimate of 3-6 months. Second, the selling price range is $3-$7 per gram and stated their estimates after selling costs as being in line with Aurora's. Third, they presume that plants yield 40-80 grams per plant about in line with Aurora and on the lower end of Grasscity's range. This is a cannabis company that is still much in its infancy headquartered in Kelowna, BC and was acquired by Canopy in July 2018. Below is the 6-months ended interim in 2017. This company added $148.2MM ($296.4M annualized) to net income even though it has not made a sale to that point. These notes are very incomplete and non-comprehensive as we are left very much in the dark on assumptions such as selling prices, costs to sell, time to harvest, and production yields. Therefore, biological asset valuation should definitely be excluded for valuation purposes. Between the 3 Canadian cannabis giants in Canada, Canopy has the most questionable and vague accounting as their average selling price has the highest range. Also, they do not specify these prices net of costs to sell, plus they allow for the assumption that plants can produce up to 386 grams which is on the higher end of Grasscity's range, meaning they would have to be using 1000-watt HPS lamps and have very experienced growers. This does not mean they actually assume that yield on every plant, in fact given that Canopy has 5.6MM square feet in production capacity, relative to Aphria's has 2.4MM and Aurora's 4.6MM, they have more space to cultivate and therefore can grow more plants. 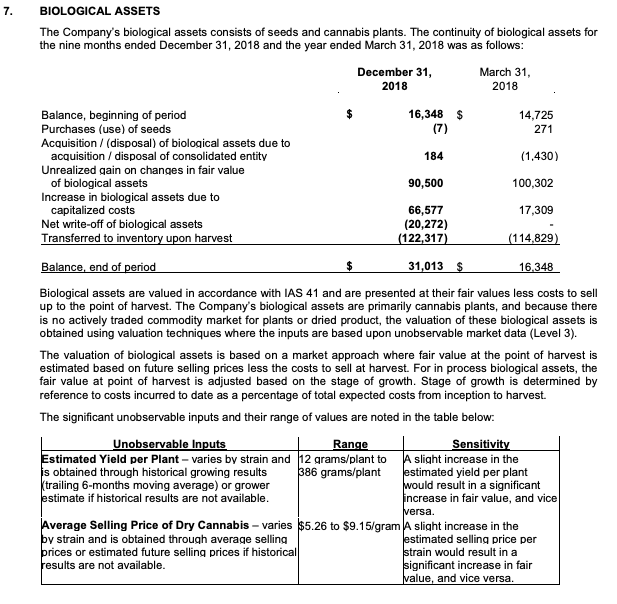 Canopy may even use more conservative assumption's than Aphria but because they likely cultivate more plants they have more in biological assets contributing to their top line. The main point to this article is to show that cannabis companies cannot be valued based on P/E multiples as earnings are going to be inflated. This is not to say that these companies are being way too aggressive in their assumptions for valuing biological assets, they are actually being quite reasonable given the incomplete guidelines they are working within. It's just non-harvested plants are not a ready source of liquidity as it takes 3-6 months to get them to harvest and until they are at that point they are essentially valueless and should not be used for valuation purposes.